The famous football match-up between Harvard and Yale was briefly delayed as Yalies dropped trou and flashed the stands. About a dozen naked or almost-naked students stood atop a wall in the century-old Harvard Stadium in Cambridge delaying the intense school rivalry until the pranksters were kicked out. Many other students took off just their shirts. 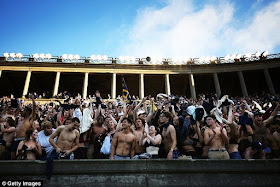 The tradition holds that some students, both male and female, strip down to their underwear or even further during the football game at the end of the third quarter. It apparently started with just one student who mooned the rival Harvard team.